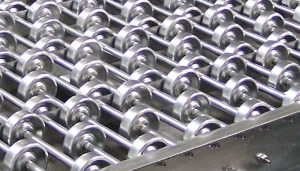 Gravity skate wheel conveyors are designed to convey lightweight products in temporary operations and system applications in manufacturing and distribution. Differential wheel action provides product orientation. Straights, curves and spurs require minimum pitch. Available in aluminum and galvanized steel wheels and frames.